A couple of weeks ago I dragged my husband to the Los Angeles Arts District because it was my birthday and that's what I wanted to do! For those of you who are not familiar with the different areas of Los Angeles, the Arts District was once home to numerous factories and industrial spaces, most of which were abandoned in the 1960s. 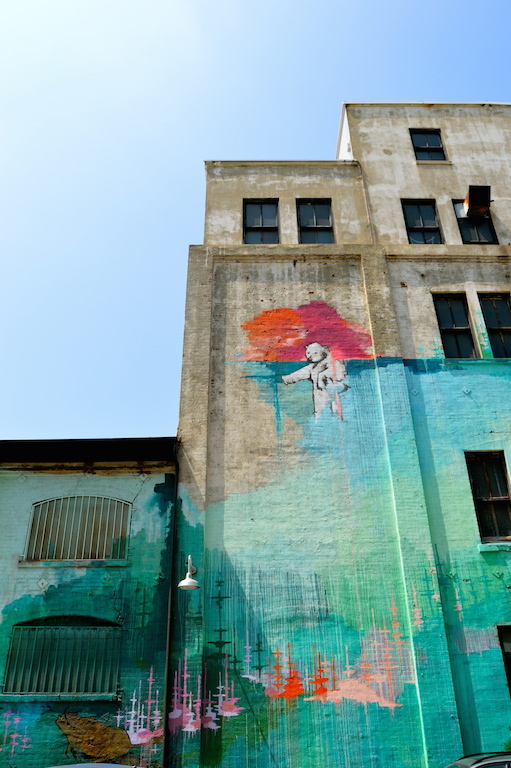 With so many empty warehouses and commercial spaces, a burgeoning arts scene began to take hold in the area in the 60s and 70s, although the area also had a sort of a seedy underbelly. 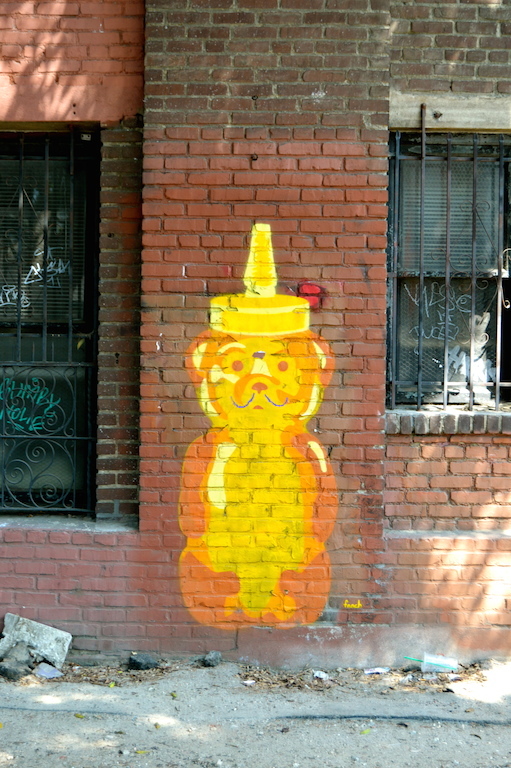 Now it's a growing mecca of street art (lots of cool walls! ), galleries, food, shopping, and bars. Essentially it's now a hipster heaven. Below you will see a pictorial stroll through this somewhat gritty, but nevertheless alluring area of Los Angeles. 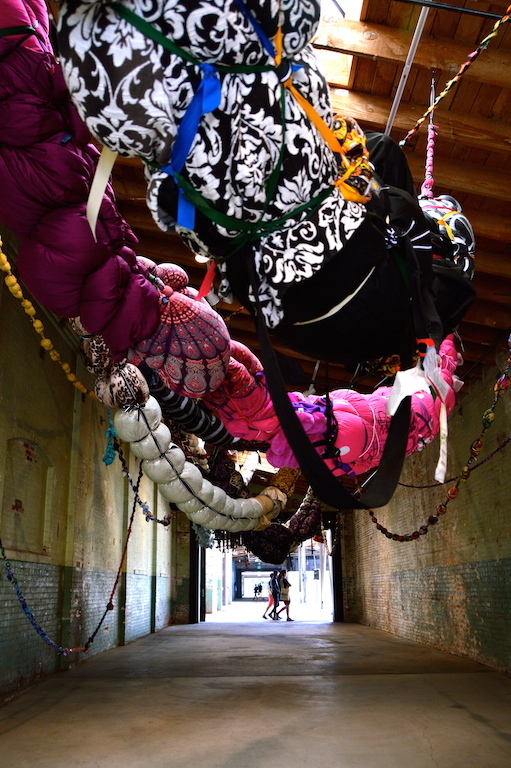 The first place we visited on our trek to the arts district was the Hauser Wirth & Schimmel art gallery. The building was actually a sprawling flour mill decades ago. Now its most distinguished feature is a sprawling mural by artist Kim West. I love the style of her work because of the colors and the strange creatures, such as the bear below, that inhabit her work and make for a very distinctive style. 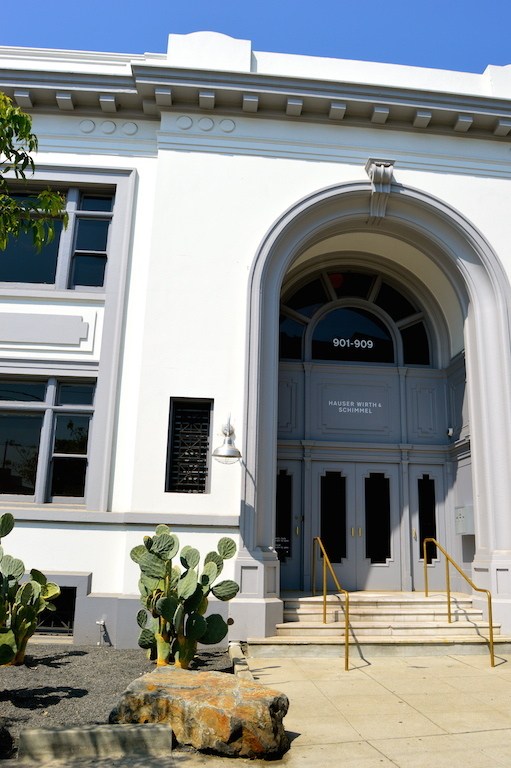 Below you will see the main entrance of the Hauser Wirth & Schimmel gallery. I think I would definitely describe the building as business in the front, party in the back! If you were wondering what type of art the gallery showcases, I am including a little of that as well. I would describe it as an "eclectic" mix of contemporary art from some very established artists to up and comers in the art world. I am not sure I quite understood everything on display (especially the weird cat thing below!) but it was colorful and fun to observe. After looking at some art and racking one's brain to extract some sort of meaning from the crazy cat installation, one works up an appetite! 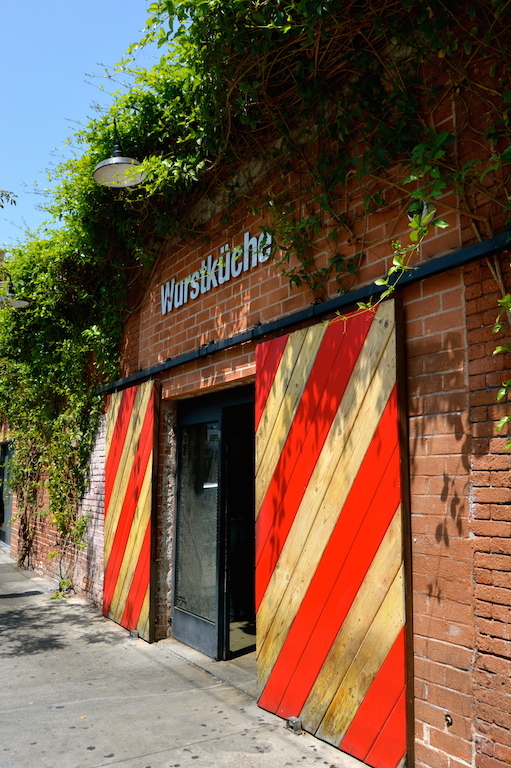 We decided to eat at Wurstkuche, an "innovative sausage" joint specializing in rare and exotic sausages like rabbit and rattlesnake or pheasant with herbs. The ambience of this place will make you think you are in a hip and trendy German biergarten, and just like a German biergarten, the beer on tap is delicious and the sausages are pretty tasty as well! Although Wurstkuche will set you back more than you might expect for sausages and beer in a very casual setting (we spent spent about $60 for four sausages, one order of fries and two average-sized beers), it's worth it for the quality of the food and beer and to experience something a little different and out of the box. 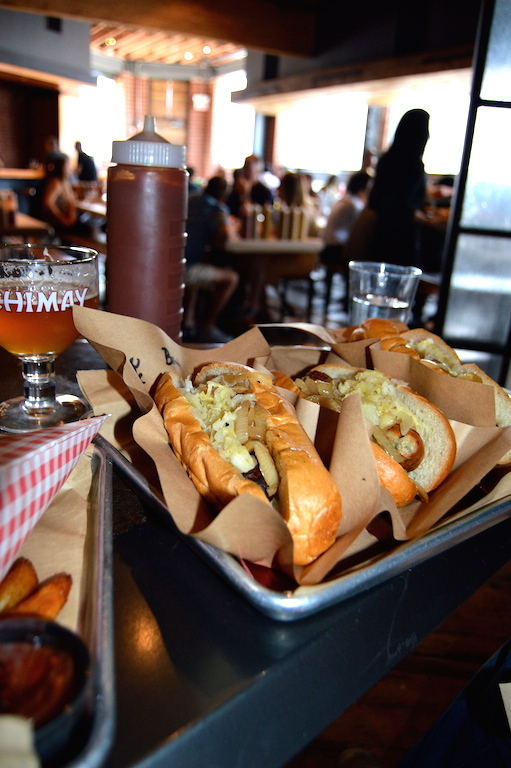 It's definitely not your average hot dog joint! 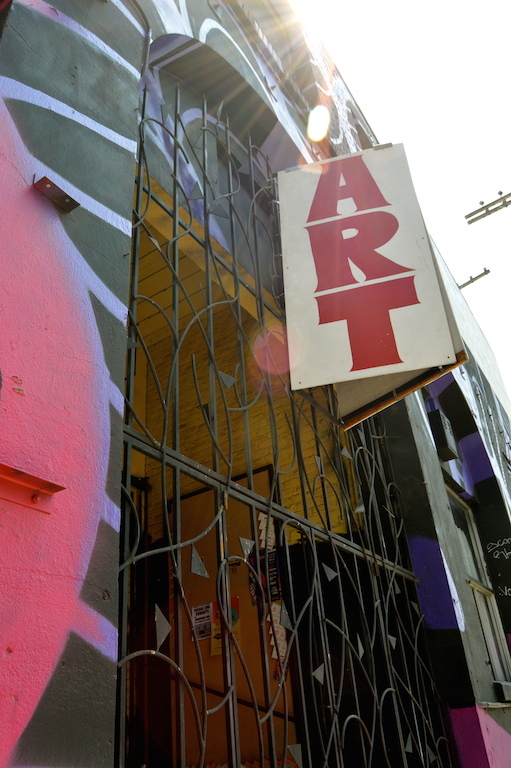 Last, but not least, are the walls of Los Angeles' Arts District. Everywhere you look, there's eye candy! 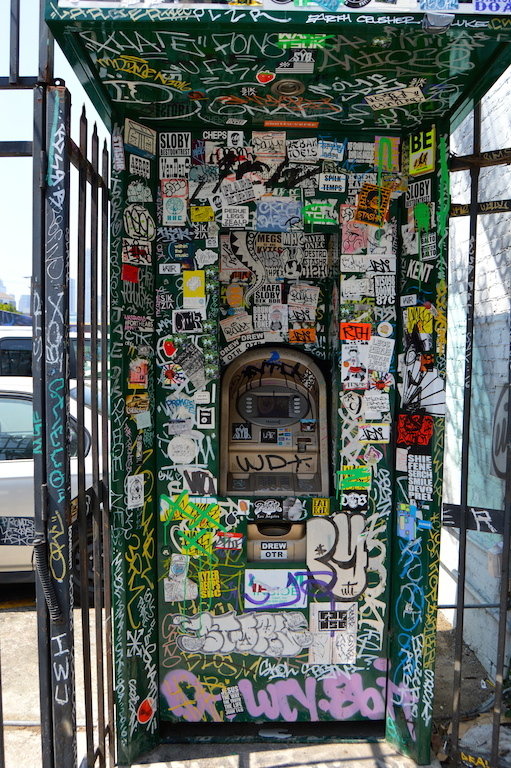 To be honest, the street art does range from the beautiful, such as this second Kim West mural below, to what amounts to graffiti, such as the ATM machine covered with stickers below. Regardless, there's something for everyone...well, maybe not my husband, although he did really like the beer and sausages! OMG, you were in heaven here with all those gorgeous art walls. Love them all. The creepy thing is the cats though - I don't get them. The exotic sausage joints sounds great but man so pricey. 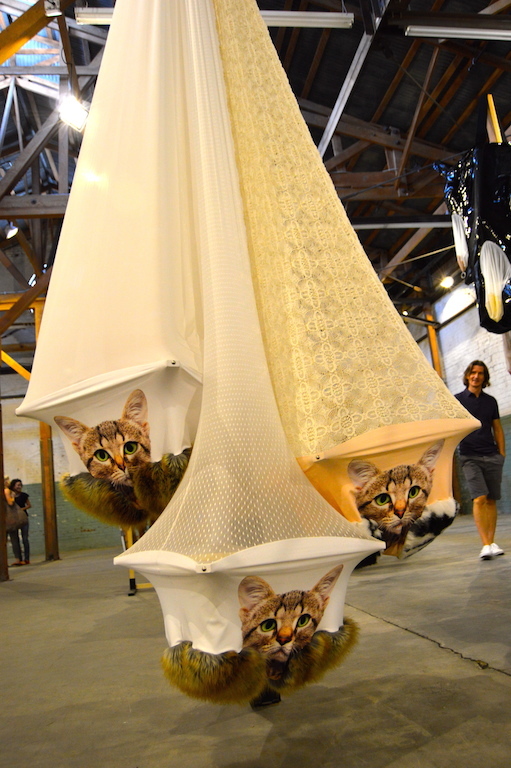 When I visit LA one day, I will make sure to visit this beautiful art district. Thanks for sharing, Katie.